I love nothing more than meeting someone who you can connect with on many levels. Rachel is one of those people. I don’t remember when we first “met” but she is one that I talk to on a nearly-daily basis. She is seriously one of the most humble and laid back bloggers that I know, and I have never even met her in real life. We share a love for spreadsheets, all-things-organized and, you guessed it: popcorn. Well, guess what…TODAY is all about Rachel and her sweet baby boy who will be making his appearance very soon. 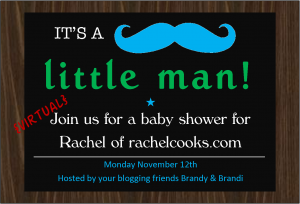 Happy Virtual Shower, Rach!! I can say that popcorn is one of my very favorite snacks. I (almost) lived on it in college and have been known to eat popcorn for dinner…along with a glass of wine, of course. Sometimes I like my popcorn a little bit spicy. I think I prefer it with tons of butter and salt – classic and simple. But for a new baby, we definitely needs some sweet and salty. So I made salted caramel cashew popcorn. The sweet and salty here is almost too balanced, if that can happen – it’s just way too easy to keep going back for another handful. The salted caramel is so simple – no candy thermometer needed, just some butter, brown sugar and a little stirring. Go ahead and add some M&M’s, Hershey’s kisses or chocolate chips for a little added sweetness. A simple salted caramel sauce is drizzled over popped popcorn and cashews and baked for a fun fall and winter-inspired snack. Heat the oven to 350 degrees. Spray a large roasting pan with non-stick cooking spray and pour in the popcorn and cashews. . In a heavy saucepot over medium heat, combine the butter, brown sugar, corn syrup and salt and stir constantly while bringing it to a boil. When it begins to boil rapidly, stop stirring and allow the caramel to boil for 5 minutes without stirring. Remove from heat and stir in baking soda and vanilla. Carefully pour over popcorn and mix well. Bake for 30 minutes, stirring at 15 minutes to break up the large pieces. When finished, spread out the popcorn on a layer of wax paper and break up any large chunks. Allow the popcorn to cool completely before serving; store in an airtight container for up to 4 days...it's actually better the second and third day. I pop my popcorn on the stove because: a) we don’t have a microwave and b) we don’t have an airpopper. So stove popping is really my only choice, good thing I love it that way. Remove from heat and transfer popcorn to a large bowl, in this case, the roasting pan. Yum, yum, yum! This sounds divine! I love the idea of the cashews! Yum, great minds think alike, we both did a form of salted caramel popcorn. This looks amazing, love it! oh yum! I love salted caramel! What a great addition to popcorn! So sweet of you guys! This popcorn looks awesome! This sounds like my dream- I’m a sucker for anything sweet and salty. And Congrats to Rachel! This looks amazing! I love all these popcorn dishes 🙂 Thank you for being a part of the party!!! Ahhh, girl you are speaking my language! I love how many people brought popcorn for Rachel! Hahaha. 🙂 Such a lovely treat, and shower! My kids and husband would go crazy for this popcorn! Looks amazing. Love this! It’s like crunch n munch on crack! I want! Hooray for a baby shower!!! Yay for Rachel! And yay for that popcorn being in my mouth. I’m obsessed with salted caramel. This looks amazing. Congratulations to Rachel! Popcorn and wine?? My respect for you when to a whole new level! I’m a sucker for anything salty-sweet, so this snack (or main dish as I see fit) is right up my alley! I love any type of popcorn and now that it has caramel and cashews its a winner! Rachel and the baby are going to love this recipe! Right about now I’m wishing this shower wasn’t virtual so I could be snacking on some of this. I want it!! Very fun treat to bring to the party! I need this popcorn in my life so bad, it’s unreal. Seriously. That last picture has me clawing at the screen! I LOVE caramel popcorn and yours looks like it turned out with the perfect sweet and salty crunch. Adding cashews was brilliant – what a great virtual baby shower recipe! I can see how this popcorn would be absolutely addicting! My mom found a popcorn popper in my grandmother’s house when she was cleaning it up, and no lie I thought of Rachel when she told me! So funny. 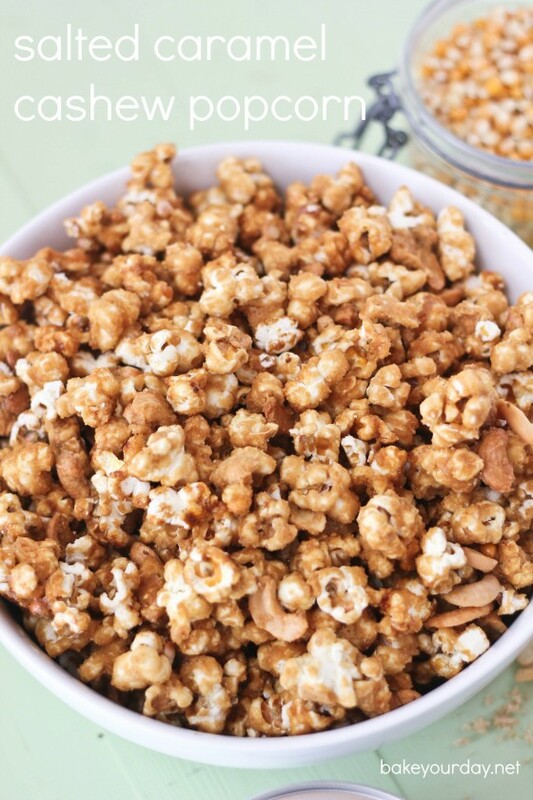 The salted caramel cashew sounds like the perfect popcorn twist! This looks just like Garretts popcorn which I love! Awesome recipe! Salted caramel and cashews?! Yes please, I’m in love! This is the kind of popcorn I can get behind! This popcorn looks so delicious!!! I love salted caramel anything. Love this! I just made some caramel popcorn the other day and I am now addicted. Salted + Cashews…perfect!! This looks fabulous! What a perfect recipe for Rachel’s shower! 🙂 I wish I could get my hands on some of this now. Caramel and popcorn is the perfect match. This sounds beyond delicious and couldn’t be easier to make. I love this recipe and will definitely make it. I will probably use Lyle’s Golden Syrup in place of corn syrup it’s so much better. If you’ve never tried it you have to, it makes everything better, IMO! So many babies right now!! This popcorn looks incredible! I’ve never made flavored popcorn because I’ve been intimidated. Thanks so much for sharing your recipe and encouraging me. This looks perfect! 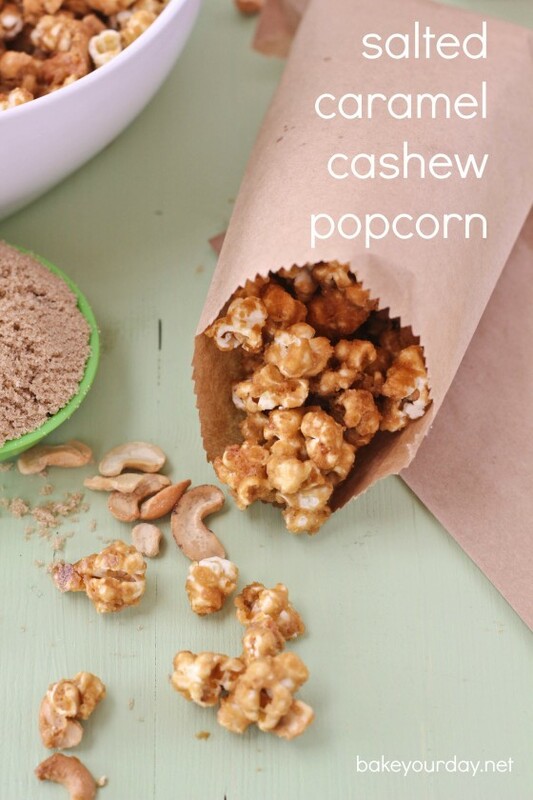 I love the idea of popcorn and cashews together! I’m sure Rachel loved this one. This popcorn sounds perfect for Rachel & for her party! Love it! Yum, this sounds absolutely delicious! Um…yes please! One BIG bowl for me! I want to sample all of these popcorn varieties…someone opening a shop soon…I would invest! I believe there may be a small error in your recipe. In the directions you say “boil for without stirring”. I’m wondering if you meant to say to boil for sp many minutes without stirring and just left out the number of minutes. Could you please clarify?! Thank you so much. This just looks amazing, Cassie!! Love the salty and sweet combo. What a great line up of recipes for this shower! Um heck yeah! One of my faves too! I love all things popcorn! And cheers to all things little boys!! Popcorn! I love it. Perfect for Rachel! I have a long and ammusing story about caramel popcorn… but I won’t do that to you on your blog. (I’d put you to sleep for sure). Cassie!! You made what may be the most wonderful, perfect snack there is. you see, it’s a regular occassion i eat popcorn for dinner. two huge bags, all to myself. now… i have to change things up a bit and go into a huge sugar coma b/c THIS IS screaming my name! Love the photos too. I want to lick the screen! This is my kind of popcorn, holy moly! Right down Rachel’s alley too! Oh my gosh, I LOVE cashews and this looks so absolutely perfect! I’m a little afraid to make it, though, because I’d probably eat a huge bucket of it all by myself. Popcorn, I think Rachel needs to buy stock in it! Love me some salty and sweet popcorn! I’m drooling over this popcorn. I’m sure Rachel LOVED all the salty /sweet treats! That is awesome! 🙂 So glad you made it!! I love caramel popcorn, and I bet I would love salted caramel popcorn even more! This looks incredible, Cassie! Just like you and Rachel – who’ve I’ve been lucky enough to meet in real life, and is 110% just as lovely! This looks fantastic! Very sweet of you guys to put that together for Rachel. Love little boys, too, and they always love their mommies! 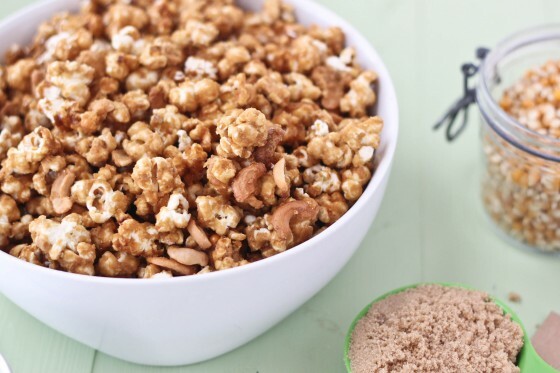 This is a perfect sweet and salty combination for popcorn! What a fun treat for a party! You guys are too sweet for doing this! And this popcorn is so perfect for Rachel! I hear her talking about popcorn all the time on twitter and then I get a major craving for it! And I’m definitely try this version – I could snack on this all day! And I’ve seen so much flavored popcorn lately. I’ve never had it so I definitely need to get up to speed and try it out. such an awesome combo! might need to make this for a party we’re having this weekend! Oooh, salty caramel is my absolute fave! Um nom! I made caramel and toasted coconut popcorn for the first time a few weeks ago. This looks incredible! Salted caramel anything makes me so happy! Love that you made popcorn – I suppose we all could have made popcorn of sorts! Man she loves that stuff!! This recipe looks so good! I’ve never made caramels before, I’ll have to try them! I need this in my life. Salted caramel is my one true weakness. Gorgeous. This would be such a fun gift to give for the holidays! 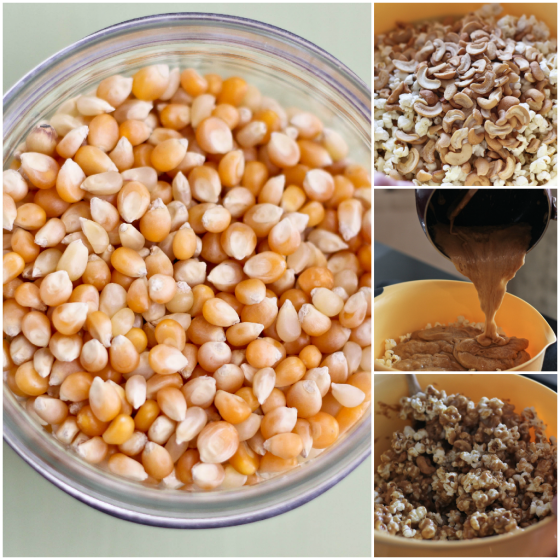 My mom always made an incredible caramel corn for Christmas and I have never tried it! i want this right now! is this possible? 🙂 we seriously need just a popcorn party. I made this popcorn tonight- it looked perfect after mixing the popcorn and nuts with the caramel, but it was BURNT after 15 min @ 350 degrees! It really needs to be baked at a lower temperature! Hi Kim, I’m so sorry it burnt for you. Some ovens operate a little differently so I apologize that the instructions didn’t work for you. I’ll adjust the recipe. I hope you’ll try again!